The EC Direct Luminaire is a classically styled fixture fit for any interior. They are designed to be pendant mounted via a rigid or cord pendant making them adaptable for a number of ceiling types and applications. 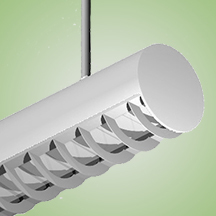 This fixture is ideal for offices, libraries, schools, etc.